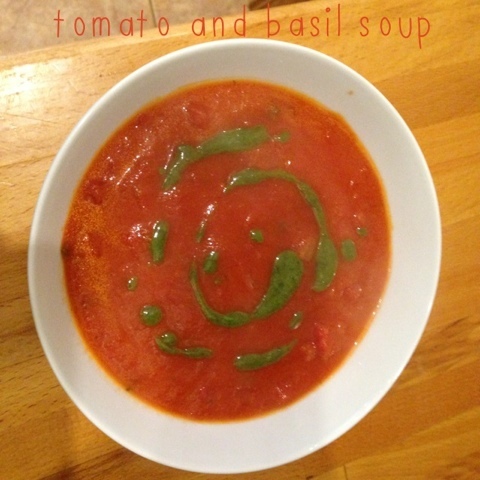 This is my basic tomato sauce recipe slightly adapted, it's my go to recipe as its super easy. 1. gently fry the onion in olive oil until soft. 2. drain 1 can of tomatoes and set tomatoes aside. 3. add the juice and 2 cans of tomatoes to the onions along with all other ingredients and simmer for 35 minutes. 4. blend the soup and add the reserved tomatoes, simmer for a further 15 minutes. If the soup is a little too thick add more water or stock. If it is a little to liquid simmer until reduced down to desired consistency. If you prefer a smooth soup, do not drain the tomatoes, just add the 3 cans in as step 2. If you prefer cream of tomato soup add 100ml cream or yoghurt at step 4. I add a swirl of basil oil which gives the soup a more intense flavour, I made that by blending a handful of basil leaves with 150ml extra virgin olive oil. Both the soup and basil oil are suitable for freezing.